Should Donald Trump stop using Twitter? For those of us that love Trump, the answer is obvious. 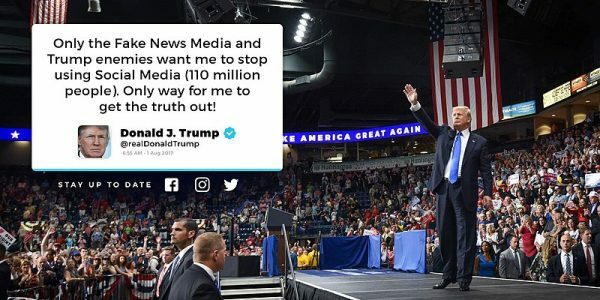 Personally, I love the fact that President Trump uses social media to speak directly with the American people. In times past, presidents always had to rely on the mainstream media to convey their messages, and the mainstream media always twists things. And so if anything, I would actually like to see President Trump use Twitter even more. But the mainstream media absolutely hates that he is going around them, and so they are always trying to convince us that he needs to stop. What most do agree on, however, is what’s gone wrong: All those tweets. “Some of his tweets are, like, what the hell does this have to do with running the country?” says Francis Smazal, a registered nurse from Marshfield, Wis.
Chandler and Smazal are members of the USA TODAY Trump Voter Panel, a sort of free-floating focus group of 25 Trump voters from across the country who have been weighing in every other month or so. Do they really sound like “Trump supporters” to you? They certainly don’t sound like any Trump supporters that I know. With these surveys, so much depends on how they ask the questions. For example, by injecting the phrase “from his personal account”, there is an inference that he should be using an official White House account instead. And like the polls that showed that Hillary Clinton would win the election, I have a feeling that they are just simply wrong. Every Trump supporter that I know wants to hear even more from Trump. They love that he is not controlled by the establishment, and the elite still deeply resent him for being an outsider. I can’t even begin to tell you how disgusted I am with George H.W. Bush for voting for Hillary Clinton. But this just demonstrates the fundamental shift that is taking place in our nation. We are taking over the Republican Party, and it will never be run by people like the Bushes ever again. The Trump revolution is here, and the next step in that revolution is the 2018 mid-term elections. Since my district is so conservative, the main battle is the Republican primary next May, and I need your support in order to win. I am proud to stand with President Trump, and if you want him to keep on tweeting, please like and share this article. The establishment would like to put an end to the fire that Trump has started, but we are going to fan the flames of this political revolution until it sweeps the entire nation. We are here to take our government back, and we are not going to allow the left to stop us.